Thalia and Chris Carlos. Photo courtesy of Michael C. Carlos Museum of Emory University. 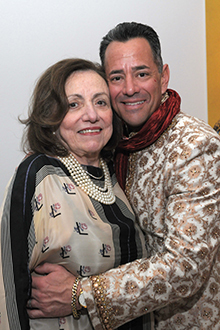 Chris Carlos, son of the late Michael C. Carlos, for whom the Michael C. Carlos Museum of Emory University is named, has committed $3 million to name the museum’s education center. It will be named the Thalia N. Carlos Education Center, in memory of Carlos’ mother, who also was a longtime supporter of the museum. The pledged funds, a portion of which have already been received with the remainder provided over the next five years, will contribute to the Thalia N. Carlos Memorial Fund, an endowment that provides annual support for educational programs, museum exhibitions and other critical needs. Each year, the Association of Fundraising Professionals brings together fundraisers, individual philanthropists, and corporate and foundation grantmakers at a National Philanthropy Day luncheon to celebrate the role of philanthropy and recognize key individuals who have made an impact on their communities. On Nov. 1, Chris Carlos was honored as Atlanta’s Philanthropist of the Year, and the Carlos Museum contributed to his nomination for this award. The Michael C. Carlos Museum of Emory University brings priceless treasures mapping an extraordinary breadth of ancient cultures, customs, and legacies to the Atlanta community. Some 20,000 artifacts from ancient Egypt, the Near East, Nubia, Greece, Rome, the Americas, Asia and Africa, as well as works on paper from the Renaissance to the present day, provide visitors with a glimpse into the art and history of world cultures. Located at the heart of Emory University’s Atlanta campus and exhibited in the landmark building designed by noted architect Michael Graves, these works of art and artifacts reveal the Carlos Museum’s meticulous care for the legacy of ancient civilizations and the learning opportunities innate in each artifact.